By 1951, when this courthouse was built, architects had largely abandoned both ornament and references to historical designs. "Less is more" was an architectural mantra and few designers were inclined to challenge that viewpoint. Even so, elements of the classical tradition persist in this well-proportioned design by William J.J. Chase. There is a formal approach to a central entrance where at least a suggestion of a colonnade frames the main doors. Attention is focused on the central portion of the building, which is balanced on each side by wings added after the initial construction. Center and wings alike form simple rectangular masses. 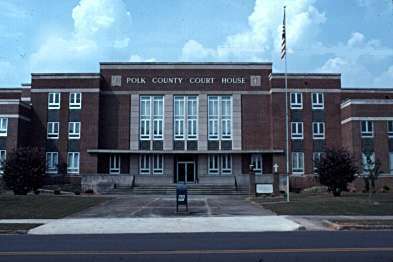 Next door to the east is county courthouse No. 2, a former city hall built in 1936 on the site of an early opera house. This red brick Neoclassical building provides an impressive terminus of the view up Cedartown's main street. to downtown Cedartown. Turn right on Prior Street. The courthouse is on the right.